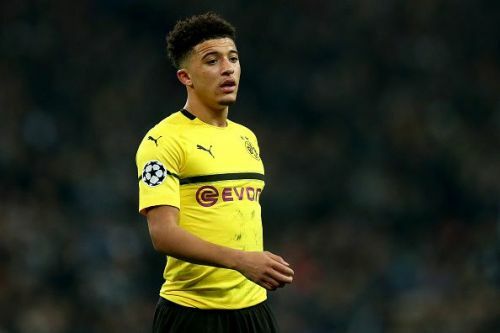 Jadon Sancho is loving life in Germany with Borussia Dortmund this season. The 18-year old moved to Borussia Dortmund from Manchester City's U-18 side for about £8 million last summer. He has been in spectacular form since the start of this season, contributing 21 goals in all competitions for Borussia Dortmund. His recent form and performances have earned him a lot of attention across Europe and many elite clubs are keeping a close eye on the teenager. One such club is Manchester United and according to many reports, are eyeing a move for the England international in the summer. They are willing to pay around £100 million for Sancho. The move makes sense as United do not have enough personnel who can play on the right-wing and with Mata on the wrong side of his 30's, Sancho will be the perfect replacement for him. The 18-year old is tearing it up in the Bundesliga, scoring 8 times and grabbing 10 assists in 24 appearances. Across Europe's top 5 leagues, only Lionel Messi and Eden Hazard (11) have more assists this season than Sancho. His stats are exceptional this season. But should United go all-in for him in the summer, even if he costs them north of £100 million? Let's discuss why they should and shouldn't buy him in the summer. Jadon Sancho could have the same impact as Kylian Mbappe in world football. He burst into the scene in a similar way Mbappe did back in 2016/17 season for Monaco. His qualities are unquestionable and can be the missing piece of the jigsaw for Manchester United and take them back where they belong. Manchester United chiefs love a high profile signing as it helps them with the commercial side of the club and they wouldn't hesitate to splash the cash on a prospect who could be the future Ballon d'Or winner. He is already accustomed to life in England and will settle easily alongside Rashford and Lingard who are his national teammates. The prospect of those three playing together will excite many England fans. Manchester United should swoop for him before other big guns join the race for him. Manchester United have many young, exciting prospects on their hands. Chong, Angel Gomez, and Mason Greenwood are knocking on the doors of the first-team and have been in exceptional form for the U18's. It will make no sense for Manchester United to spend £100 million on Jadon Sancho when they can nurture one of their own to the same level. Manchester United should also not forget about the recent big-money signings of Angel Di Maria and Alexis Sanchez who flopped very badly at the club. Both were more of a "commercial signings" and they never looked like Manchester United players. And it feels like they are doing the same with Jadon Sancho. The thought of buying an 18-year old wonder-boy will excite the Manchester United hierarchy, but more for the commercial side of it than the footballing side and could turn into another horror signing for an eye-watering amount of cash.